Adapted from a novel by Osbert Sitwell, A Place of One's Own has a double-edged title: It refers to a physical place as well as a spiritual one. An elderly couple (Barbara Mullen and James Mason) purchase an old house. They've been warned that it's haunted by the spirit of a murdered girl, but decide to set up housekeeping anyway. 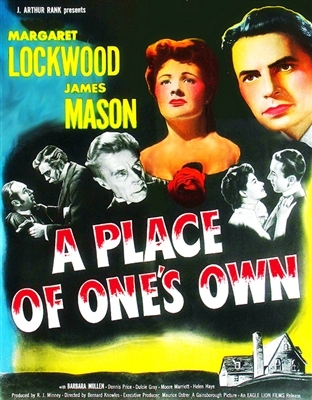 The restless ghost responds to this intrusion by possessing the soul of Annette (Margaret Lockwood), the old couple's young live-in companion. Leading man Dennis Price is on hand as Dr. Selbie to attempt an emergency exorcism on the vulnerable Annette. Those who love the forties-era Gainsborough melodramas will want this spooky movie. Fine picture quality.